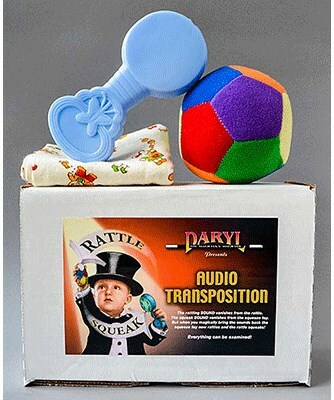 From Daryl, the magicians' magician, it's the ultimate kiddie trick performed with kiddie toys! At AmazeKids, we're loving this because props like these are unusual for a magic show. Better yet, the effect, "a sound transposition," is even more unusual. That's right! It's an Audio Transposition. Watch the video and you'll see it all happen right before your eyes. You shake a rattle and you squeak a squeeze toy. Then you make the sounds disappear. But, when you put the sounds back, the squeeze toy rattles and the rattle squeaks! Not only is the possible. This is easy. There is no sleight of hand. The special gimmicks make it possible to learn in less than 15 minutes. Add your own storyline and you'll be fooling and delighting friends, family and youngsters in no time. Better yet, the props are examinable after you've made the sounds switch places. Both Danny Orleans and his wife Jan Rose have performed Audio Transposition in their birthday party shows for children. Both agree that it's a great trick for small groups of boys and girls. You will too! You get everything you need to present the whole hilarious routine: two baby toys, a baby blanket to put them in, (colors may vary) full instructions and the gimmicks. Get Audio Transposition for your children and family shows. The kids won't believe their ears!